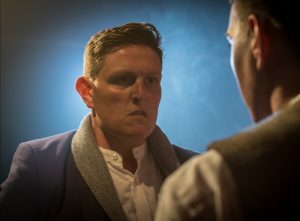 There’s nothing more inspiring than the story of those that tried and now it is being told in Ross McGregor’s compelling The White Rose at the Jack Studio Theatre in South London. It has been 75 years since 21-year-old German student Sophie Scholl, her older brother Hans, and friend Christoph Probst were executed by guillotine for the crime of high treason, for resisting Nazism by writing and distributing leaflets. The White Rose – the collective formed by the Scholls and their young, educated, spirited group of friends – didn’t even come close to bringing down Hitler. But their legacy far outweighs the initial impact of their protest. As a symbolic act of bravery, it was colossally powerful and lives on. The young men and women who are locked up today, flogged, or worse, in Egypt, Turkey and Saudi Arabia, for the crime of producing videos or tweets criticising their governments, still believe they can start a revolution and change the world. Arrows & Traps have produced an astonishing show. The first half is told through joyous, hopeful, witty flashbacks, with some brilliantly quotable lines. 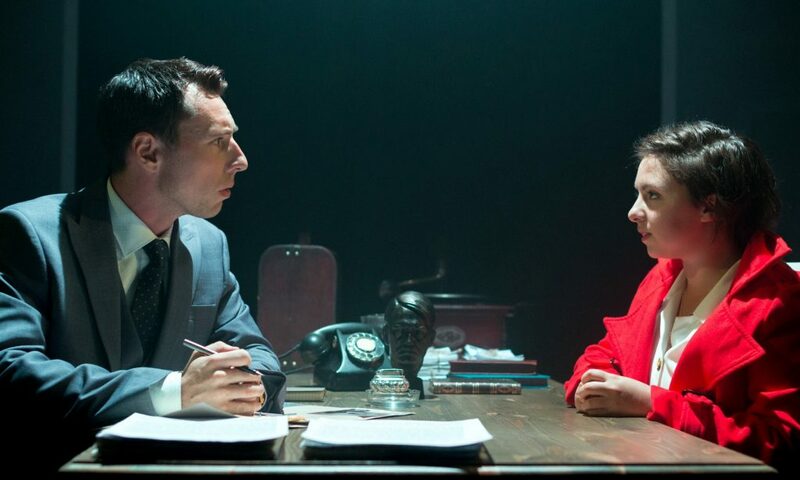 It is punctuated by quick cut scenes of Sophie holding her own under interrogation by the least-clichéd Nazi I’ve seen on stage or screen (Christopher Tester, superb as Gestapo officer Robert Mohr). He is all the more intimidating for being so measured, calm, and, as the saying so often goes, ‘just doing his job’. Tester comes into his own in the second half as we see Mohr start to crack. The frustration of being faced by the brave, unbreakable Sophie, as she somewhat naively martyrs herself, is too much. This Fräulein is not what he expected. The White Rose is surprisingly funny for a story about persecution and death in the Third Reich, with McGregor’s script littered with memorable lines as the students plot and pursue their revolution and dream big. Humour is one of the greatest acts of small rebellion and for these larking bohemian youths, a “little utopia among the wastelands of fascism”. A gag about finding grammatical errors in quotes from Hitler is quickly followed by a reference to 300,000 Jews recently slaughtered in Poland. While named for the collective, The White Rose is billed as Sophie’s story. History has certainly best remembered her, but this is somewhat of a miss-sell. Lucy Ioannou is brilliant, playing the bright, girlish, and so very very young, Sophie, but this is very much an ensemble piece. Each character gets an adequate chance to develop their individual stories and earn their place in history. This, to me, is very much a tale about the power of collective thought and action. 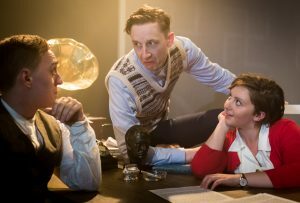 Connor Moss is superb as the quirky Alexander Schmorell, flirting with both Hans and Sophie in equal measure. And Pearce Sampson prompts my first flood of tears as the quiet, stoic Christoph Probst, willing to fight for what’s right despite having three children under two at home. Alex Stevens’ God-fearing Willi Graf is intense and tortured as he grapples with his conscience while Hans (Will Pinchin) urges more direct action against the state. Pinchin is charismatic in his powerful performance as the group’s visionary figure. Beatrice Vincent, as Traute Lafrenz, plays a vital second role as narrator. As an aside, it is worth noting that Lafrenz, at the age of 99, is still with us. Having survived the arrest and execution of her friends she later moved to the US and had a successful career as a doctor. Both halves begin with familiar but still shocking footage of the Führer, barking into a microphone, marching troops, tanks, parades, in expertly cut, high quality, montages. After the interval there’s the occasional flash of colour which always brings home how recent this period, and this horror, was. 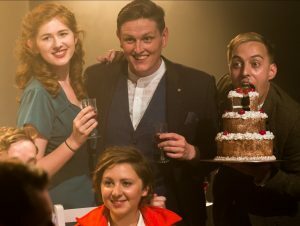 At the end we see cinema or TV drama-style stills of the real White Rose members (a number of doppelgängers further emphasising the play’s super casting) in all their tragic beauty. That set my tears off for the third time. If I’m nitpicking: the second half is a bit repetitive. The stormtroopers are visually very creative but jar a bit with the production overall and aren’t really needed to set the mood of terror. We’re in Nazi Germany and we’ve just seen montages of Hitler, we get it. And I thought the voiceover by Andrew Wickes of Roland Freisler, as he’s sentencing the defendants, sounded more Hammer Horror than arch Nazi judge. Meticulously researched by writer and director, Ross McGregor, though, especially as he recreated the way Freisler belittled and verbally abused his victims in the People’s Court. The end is heartbreaking, even though we know it’s coming. Ioannou’s desperate monologue as it finally sinks in what’s about to happen to her, just a short few days after her arrest, is one of the most gut-wrenching performances I’ve seen. McGregor gives us a story of a young generation’s courage, as they fight to reclaim their country from those who are destroying it. The allusions to the modern day aren’t subtle. You’ll leave weeping, angry and, if you’re anything like me, questioning whether you would or could ever be so brave. Arrows & Traps are back at the Brockley Jack in the run up to Halloween with McGregor’s take on Dracula. I can’t wait. 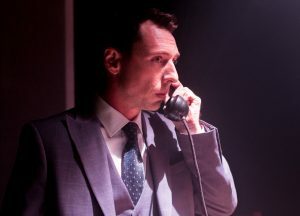 The White Rose runs at the Brockley Jack Studio Theatre until August 4.
Review. 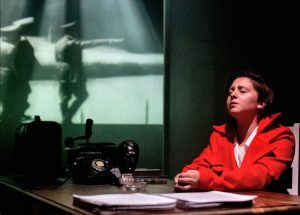 Ross McGregor’s harrowing The White Rose sees newcomer Lucy Ioannou, as wartime freedom fighter Sophie Scholl, give one of the most gut-wrenching performances I’ve seen. An astonishing play.